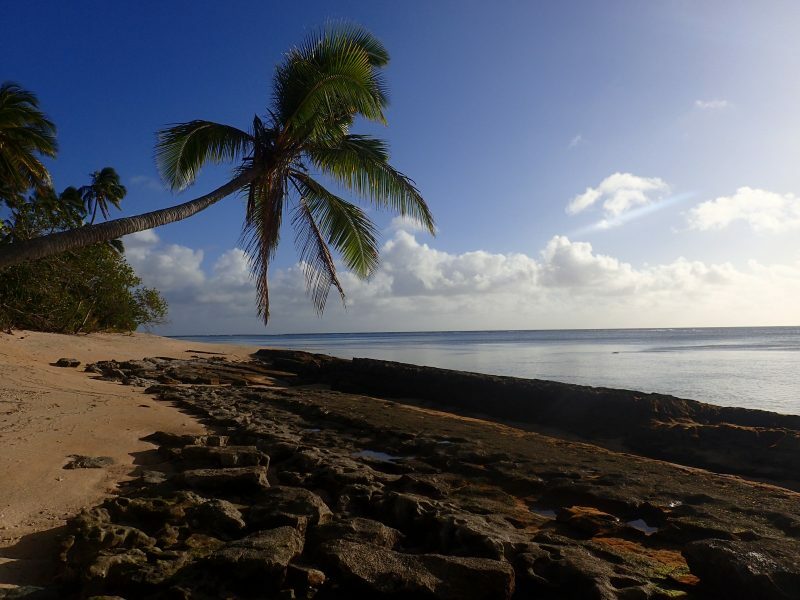 Several years ago, I had a profound experience on a remote little coral island in the Kingdom of Tonga, in the middle of the South Pacific. I was a crew member aboard a 46’ sailboat, traveling in Tonga and Fiji. This trip was a time when I became very aware of my consumption because when living on a boat, you carry your waste with you. The South Pacific is a region of little islands scattered across wide ocean spaces, and my eyes were opened to island culture. An island is analogous to a large boat—your waste cannot go far. The idea of “throwing it away” began to seem suspect. Does anything really “go away”? A seemingly pristine beach on Tungua Island, Kingdom of Tonga. Upon closer inspection, we realized the volume of plastics that could be found even on an island this remote. Photo by D. Barlow. After spending a night at anchor in the Kingdom of Tonga when I listened through the hull to signing humpback whales and felt their deep tones vibrate our mast, I thought I was in a place as pure and untouched as I would ever experience. The next morning, we ventured to shore on an island that we could circumnavigate in less than an hour on foot. But the soft sand was strewn with more than just conch and cowrie shells. It was also strewn with plastic. I began to pick up the trash items on the beach, and before long I had a large bag filled to the brim with plastic. The captain humored me when I wanted to bring it back to the boat. But what was I going to do with it then? These remote island places have very little infrastructure—they can’t recycle it there. So should I take it to another island where it would likely get barged out and dumped back in the ocean? Or a landfill? What struck me most was the realization that none of these products were manufactured on these islands. Some of this plastic may have been imported to the nearest island with a town or city, while some likely had drifted across the sea to this landing spot. All the plastics that I picked up on that one, small island were just a tiny portion of ocean plastic that wash ashore on the world’s beaches, a tiny glimpse of a much larger issue. Eight million tons of plastics make their way into the oceans each year. Let that number sink in. There is no such thing as “throwing it away”, because “away” does not exist. “Away” is the ocean. “What lies under”. Image credit: Ferdi Rizkiyanto. Before sitting down to write this, I participated in a beach cleanup event here in my local community in Newport, Oregon. Today along the whole Oregon Coast, over 3,000 volunteers removed more than 15,000 pounds of litter and marine debris from the coastal places they love. A few weeks ago Surfrider Foundation screened the documentary Straw, directed by Linda Booker. Following the well-attended screening, a panel of community members from Surfrider, the Oregon Coast Aquarium, and Thomson Sanitary Services answered questions from the audience. In a lively discussion, we learned about why China is no longer accepting our recyclables and consequently we can only recycle plastics #1 and #2 here in Oregon, about how marine animals are rehabilitated after becoming entangled in plastic waste, about how Surfrider is encouraging local businesses to switch to paper straws and only offer them by request. As daunting as it is to think about the scale of our plastic consumption and the damage it causes, I am encouraged by the engagement and bottom-up movement in my community. My life is shaped by the ocean—it is my inspiration, my work, my passion, my place of adventure and joy, the place that humbles me and heals me. Imagining the relationship between the products I use and the ocean is what makes me think twice before consuming. If I am driving in my car and want to stop for coffee but don’t have a reusable mug with me, I consider “if I were on a boat, would I drink coffee out of a single-use cup and then throw it away, toss it over the rail?” Of course not. So I invite you to think about the plastic in your life—it is everywhere. Think about how that plastic relates to what you love. Will it make its way into the stomach of a baby albatross, a sea turtle, the filter-feeding shellfish and large predatory fish that you love to eat? Lifestyle changes can be simple and impactful. As a consumer, use your purchase power—when you have the option to buy a product wrapped in plastic or one that is not, opt for no plastic. Show manufacturers what you value. Bring reusable bags to the grocery store. Use waxed paper instead of plastic saran wrap. Talk to others, share your choices with them, encourage them to minimize their plastic use. And if you need context or motivation, imagine the relationship between the products you consume and the places that you love. Previous Previous post: Sea Otter Management in the U.S.